A well-featured controller keyboard with bonus Triton engine onboard. For the money it's hard to beat. Plenty of real-time controls including pads, dials, DAW transport, wheels, sliders and touchpad. Templates onboard for all major DAWs. The Triton sound engine provides a wide range of good-quality staple sounds. No way to save edited sounds. Sound engine parameters are basic. The new Taktile range of MIDI controller keyboards nicely fills the gap left by the discontinued KONTROL range of MIDI controller keyboards. But, never to rest on its laurels, Korg's latest controllers include even more real-time control and functionality, with the surprising addition of the old but well-respected Triton sound engine. 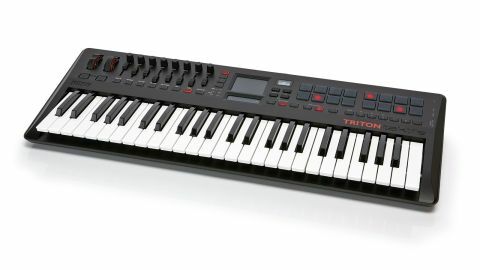 "Not only can you use the touchpad to affect the internal sounds during recording or live performance but it also sends MIDI"
First off, build quality is generally good for the money and all the buttons/ pads are made of translucent rubber and feature multi-colour backlights - this is great for onstage or in a dark studio. There's a pitch bend and an assignable mod wheel above the keyboard (to enable a shorter footprint) and next to those are eight sliders with eight rotary dials above, all of which can be assigned to MIDI CCs of your choice. The sliders and rotaries feel fine (though there's some play in the rotaries) and the keyboard is nicely playable, though there's no aftertouch. Connectivity-wise there's buss-powered USB (or power via an optional USB mains adaptor), a mini-jack/headphone audio out, MIDI out and two pedal connections. Each slider also has a function button below it which can be assigned to a MIDI CC of your choice (you can store all front panel user-assignments in scenes too) and when in Sound Mode (which turns the Taktile into a Triton-based synth) the rotaries control the filter, envelope and the two master FX blocks, though there's no deeper editing of the sound engine beyond these rudimentary parameters - a sound editor would really open up the possibilities here, so perhaps this could be included in the future. Also, there appears to be no way to save edited sounds so once again perhaps this could be addressed in an OS update. Moving to the centre, you'll find the Mini Kaoss Pad 2-style touchpad and ribbon selector, which are indispensable features. Not only can you use the touchpad to affect the internal sounds during recording or live performance but it also sends MIDI on both its X and Y axes, it can be used to play scales and, as a further bonus, it can also act as a mouse-style trackpad (the ribbon selector is generally used as an incremental controller for scrolling through sounds or parameters and it works well too). "There are 512 solid bread-and-butter sounds onboard including some good pianos and EPs, lush strings, juicy synth basses and leads, drums and more"
Clear and concise parameter/function feedback is given via the handy OEL screen and you always know where your settings are at a glance. All things considered, the Taktile is very easy to navigate for beginners and pros alike. The 16 assignable velocity sensitive backlit pads (which most folks will assign to drum duties) can also be quickly assigned to play individual notes or chords according to a user chosen scale and my three-year-old daughter was playing chords and scales (and sounding good!) within seconds without touching the keyboard once! Let's also not forget there's a six-mode/50 rhythm arpeggiator onboard too that fires out MIDI information. The Taktile also ships with preset templates for all the major DAWs which takes the headache out of those tedious controller set-up sessions! Setting up the Taktile to use with Logic X was simple - you install a controller plug-in and editor/driver and then the sliders are auto-mapped to user-chosen groups of eight mixer channels, the rotaries mapped to the pan controls, the function buttons to mutes and the transport to Logic's transport. Finally, though the Triton sound engine is pretty much a preset affair, there are 512 solid bread-and-butter sounds onboard including some good pianos and EPs, lush strings, juicy synth basses and leads, drums and more - it's a pretty versatile little controller/synth! To conclude, as an all-round package with a street price of around £339, the Triton Taktile 49 is hard to beat. It's a surprisingly inspiring and versatile controller and a solid/portable performance synth too.